As mentioned in our season preview, I’ve been looking ahead to this show for quite a bit now, preparing by reading the light novels. I didn’t manage to finish all 6, but I’m well ahead of the anime and should finish before this show is over. Let me just state outright: Nekomonogatari White “Tsubasa Tiger” is the best volume of this novel series I’ve read (the next volume, Kabukimonogatari “Mayoi Jiangshi” taking 2nd place). It is by far the most personal, engaging, genuine, and simply interesting of Isin Nisio‘s series of light novels. You can actually read it in English in its entirety over at Baka-Tsuki. Not coincidentally, it also has a very different narrative style compared to other volumes, one which Nisio himself admitted was designed to be hard for Akiyuki Shinbo and his team at Shaft to adapt. So the big question is, Will Shaft manage to do this story justice? After one episode, it seems clear that they’re sticking to their wheelhouse, with results that, in contrast to the book, feel extremely familiar. But I think it works. Another season of Monogatari has arrived! I don’t feel as disconnected from the series as I did between the original and Nisemono since there was Nekomono just a couple months ago. So I’m all ready for this return! These shots feel intimately familiar despite being brand new. The latest oddity, a mysterious and rather haughty tiger. lvlln// The simply named Monogatari Series Second Season adapts 6 novels in Nisio’s Monogatari series, the first of which is Nekomonogatari White “Tsubasa Tiger.” It is the direct sequel to last year’s Nisemonogatari, taking place in August of the same summer. It all started with Koyomi Araragi’s encounter with a vampire (Kizumonogatari “Koyomi Vamp”, the 2nd novel) which led to his encounter with Tsubasa Hanekawa’s cat problem (Nekomonogatari Black “Tsubasa Family”, the 4th novel), followed by his encounters with oddities involving all the other main heroines (Bakemonogatari, the 1st novel (2 parts)) and his sisters (Nisemonogatari, the 3rd novel (2 parts)). As should be obvious, this series enjoys telling things in non-chronological order, and we’ll see plenty more of that this season. Neither the novel nor Shaft’s adaptation does much to ease new fans into the setting, so if you’ve neither watched the previous seasons nor read the books, you’re better off avoiding this. Indeed, Tsubasa’s opening narration outright states that the purpose of this story is to dispel the image of her that Koyomi has built for the audience. 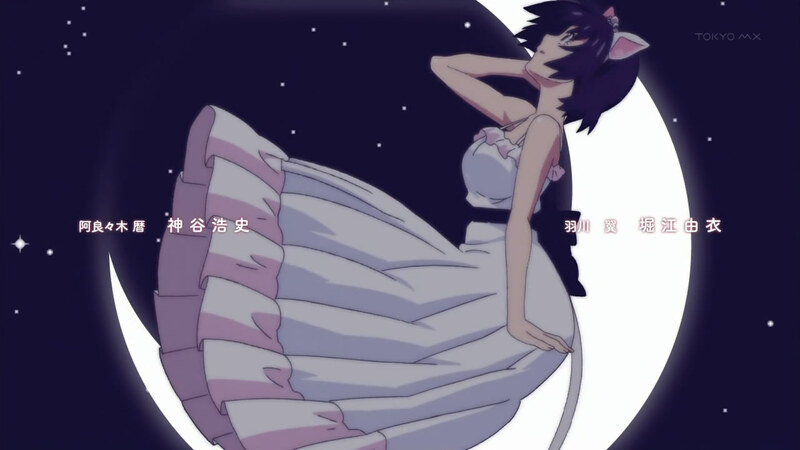 Nekomonogatari White is the 3rd story featuring Tsubasa as heroine, with Nekomonogatari Black and the Tsubasa Cat arc of Bakemonogatari telling her prior troubles with the meddling cat caused by her horrible family situation and her crush on Koyomi. It is also the first not to be told from Koyomi’s perspective. He is largely absent from the story, leaving Tsubasa and her friends missing a valuable resource for solving her problem, similarly to how Koyomi himself was missing Meme Oshino in Nisemonogatari. 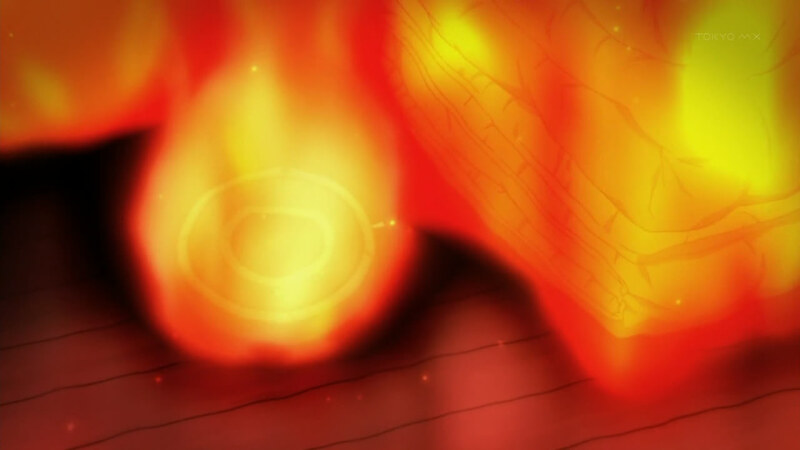 In this first episode, Tsubasa has already encountered the tiger, but the more urgent issue of her burned down home overshadowed that. Of course, everything will come together neatly by the end, but in the meanwhile, we will get to see Tsubasa’s journey in unraveling both mysteries as she bounces around from place to place, friend to friend. Tsubasa with bed head is too adorable. Good job with the face at the moment of realization that that’s her house burning. Tsubasa affectionately calls this just “Roomba” (not “the Roomba” or “a Roomba”). You’ll recall her mind went to it when she was thinking of her house having burned down. That said, she had no love for the object. Kara// One thing I found really interesting right from the beginning here was the fact that this was all from Tsubasa’s point of view. 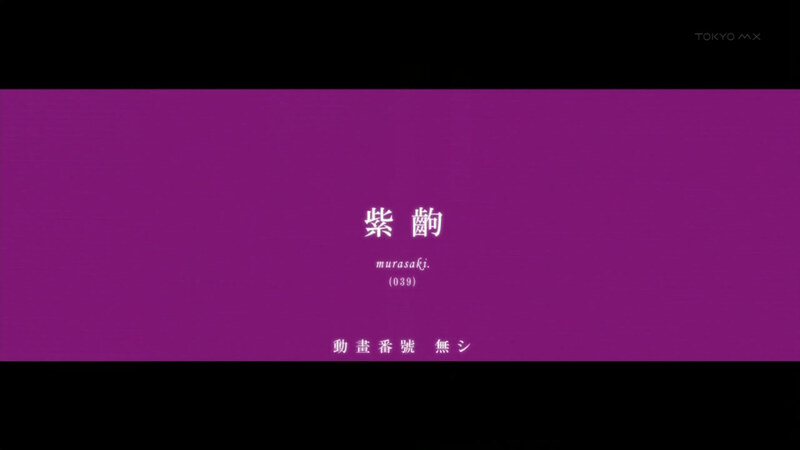 My memory isn’t the best, but I don’t think Monogatari does this often [Ed. Note: In fact, it has never once done this until now], and this was an entire episode of it. It’s normally all narrated by Araragi, and he didn’t even really appear in this episode. Anyways, this was a really interesting look at just what’s going on in Tsubasa’s head. All of the girls are presented with their odd personalities, but it’s just so interesting seeing what’s going on behind them as well. 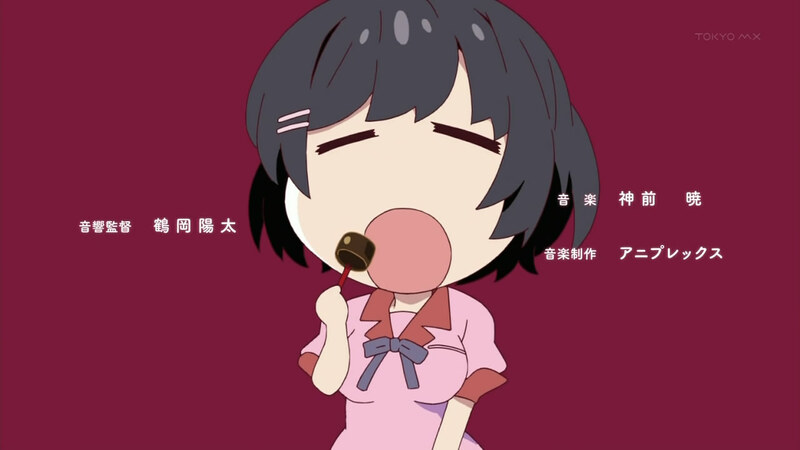 Especially with Tsubasa talking about how she’s not the saint Araragi depicts her as, or her disconnect from her household. I mean, we knew about it already due to the events in Nekomonogatari Black, but it’s different hearing Tsubasa narrate through her daily life with that mindset as opposed to Araragi telling it from his own conclusions. Plus with this, we saw how some of the girls react around someone other than Araragi. I didn’t even think Mayoi and Tsubasa ever talked [Ed. note: Tsubasa runs into Mayoi and Koyomi on Mother’s Day during the Mayoi Snail arc], and Senjou kind of surprised me. I kind of hope that the other upcoming arcs do this kind of thing as well, but maybe Tsubasa is just special [Ed. note: Your hope is not misplaced]. I love how the full body shot shows off her build. Girl’s got guns! One shot that was entirely expected, and another that was entirely not. 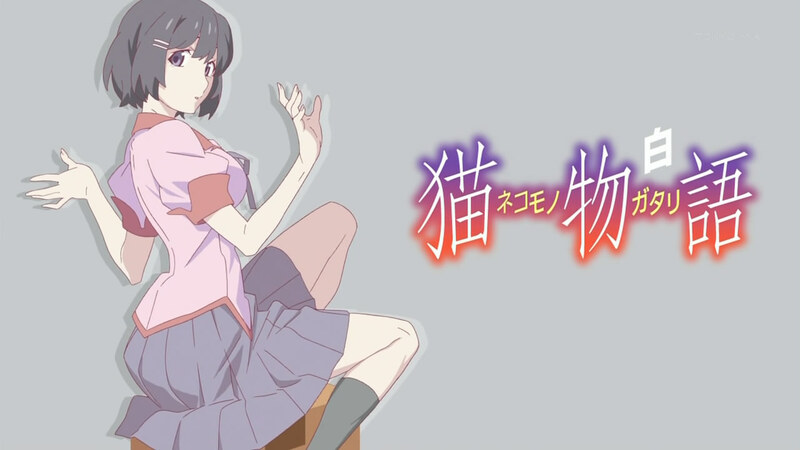 lvlln// Both Nisemonogatari and Bakemonogatari started off with a heavy dose of Hitagi Senjougahara. And why the hell not? Her sharp tongue and irreverent attitude has captured the hearts of many, to the point that she very well may be the face of the franchise. So it’s no surprise that she’s back to kick things off here, being Tsubasa’s confidant with respect to supernatural issues, then forcibly dragging her to the safety of her home following the fire. 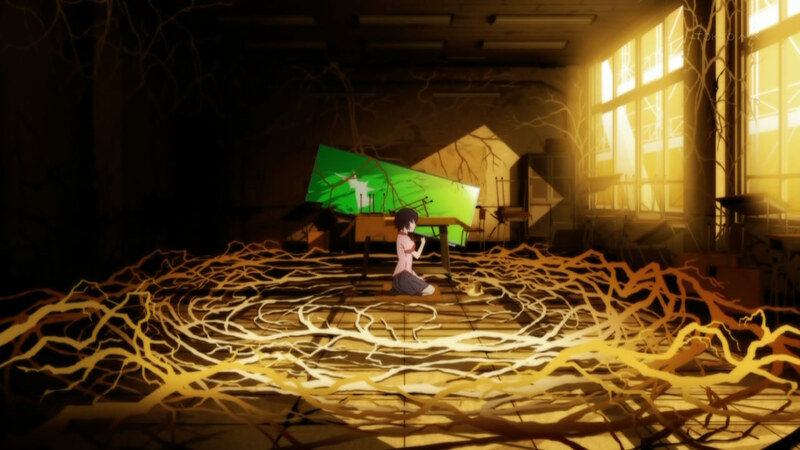 Her distressed awakening of Tsubasa at the abandoned school marked the first time we saw her tears since her arc in Bakemonogatari and the first time ever we’ve seen her upset like this. It’s a sight that her boyfriend is not given access to, and I have to love how Shaft went all out in showing her completely losing it. 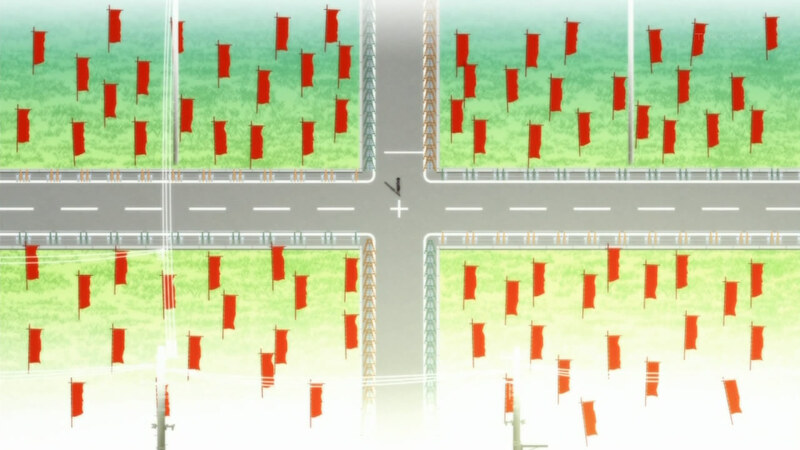 Once they got to Hitagi’s home, though, things felt very familiar, in a good way. Her abrasive wit was back, along with the proclivity to strip in her room in front of the narrator as in the 2nd episode of Bakemonogatari (except now she’s showing some tendencies that seem to be more fitting for the other half of the Valhalla Combo). It’s an interesting reversal from Nisemonogatari where Hitagi was clearly the one being bullied by Tsubasa and a reminder of why we fell in love with her in the first place. As an aside, there’s a bit of expectation reversal from the novels that wasn’t really possible in the anime. A chapter cut from the Tsukihi Phoenix adaptation had Koyomi talking about how overly sweet and meek Hitagi had become (translated over at CE Light Novel Translation, something only hinted at in the final shot of her at the beach. However, we can see that she’s still very much the sarcastic person we’ve come to know and love, and any signs of “rehabilitation” noticed by her boyfriend must be the result of an act. 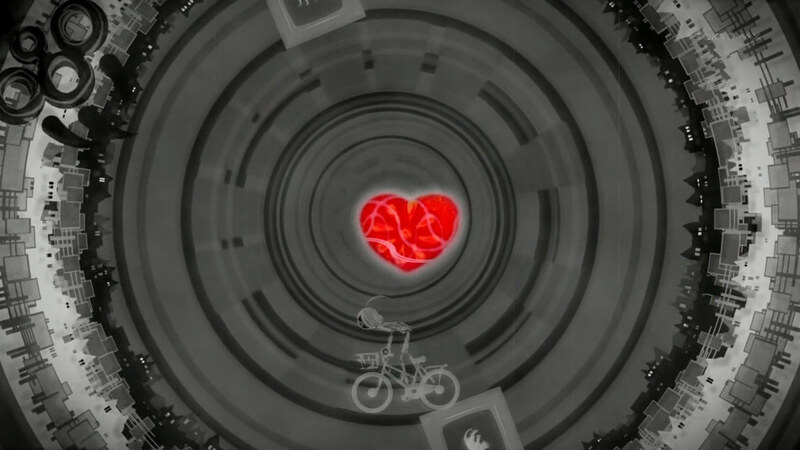 Plenty of lovely shots in the opening. Not quite as much variety or energy in the ending. lvlln// The show continues to have the heroine-specific opening theme with music by Satoru Kosaki and lyrics by meg rock, Chocolate Insomnia this time sung by Tsubasa’s voice actor Yui Horie (maybe that means we’ll hear Maaya Sakamoto in an opening, as well as Chiwa Saito doing a follow up to the objectively best Monogatari opening, Futakotome?). I guess that title fits the pattern of the prior two, Sugar Sweet Nightmare and Perfect Slumbers. The animation sequence reminded me a bit of the one for Perfect Slumbers from Nekomonogatari Black, with its panning scenery and mellow feel. Those black cats and the morning stretch sequence were pure gold. 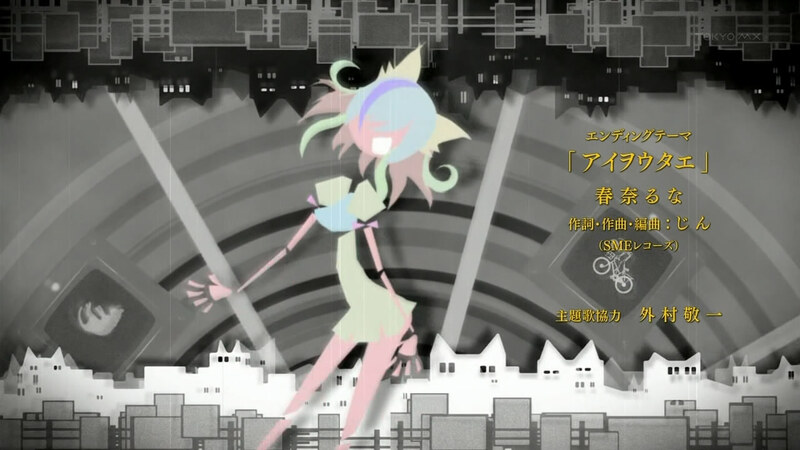 Just like last year’s Nekomonogatari Black, this one featured an ending theme not written by supercell’s ryo, the man who kind of took anime fandom by storm with Bakemonogatari‘s Kimi no Shiranai Monogatari and who was also responsible for Nisemonogatari‘s Naisho no Hanashi. Luna Haruna‘s Ai o Utae sounded a lot like it was going for the same feel as Kimi no Shiranai Monogatari, except with a focus on violins instead of piano. The ending animation still featured art by Hajime Ueda, but the way it’s presented makes me think this is the rough draft version like what we got in the first couple episodes of Nisemonogatari. I certainly hope Shaft prepared something more for this; at the very least, it needs to change for each arc. 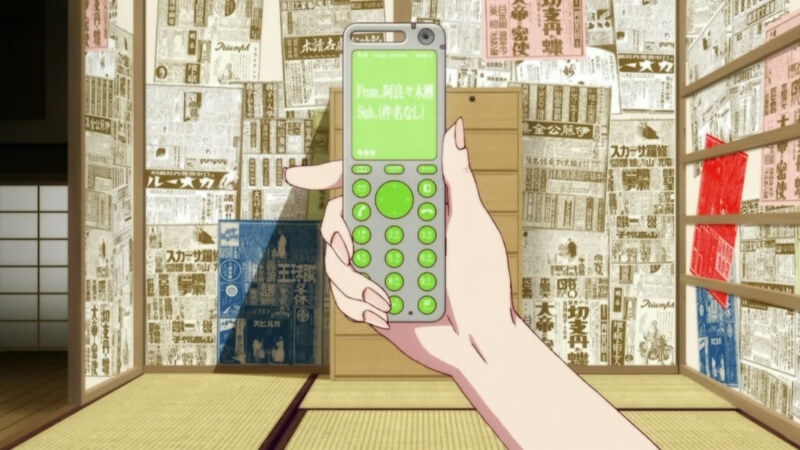 When Tsubasa picked up her phone to read Koyomi’s message, she found that she had received 957 new messages – 956 of which were from Hitagi the previous night looking for her. More than anything, this show feels like a natural continuation of Shaft’s Monogatari adaptations, which I’d say is generally a good thing. The franchise owes much of its success to its signature visual stylings, after all. That said, I find myself wondering how Shaft might have been able to do something completely different for this adaptation. Besides featuring a new narrator, Nekomonogatari White also featured a very different style of narration, with Tsubasa’s internal monologue taking up most of the space that used to be dominated by conversations. So a wildly different approach in the anime would have been appropriate. But what’s here works just fine. 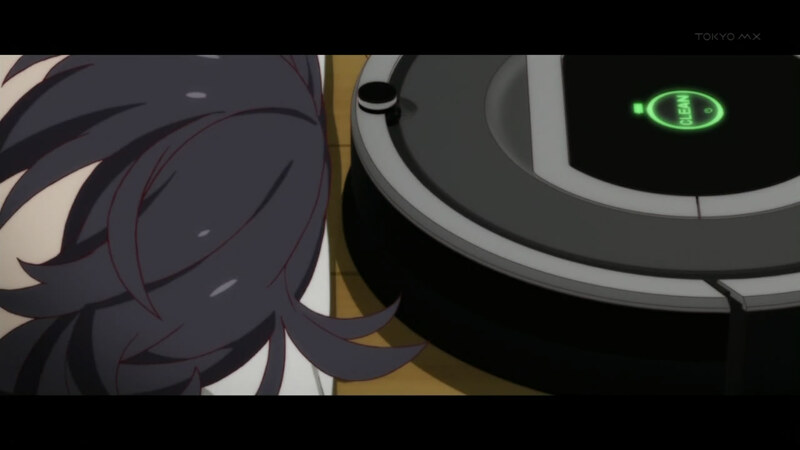 From the very first scene showing Tsubasa’s morning routine with Roomba, there was no doubt this was a Monogatari show with all of its quirks. The art and animation are just as bold and crisp as we remember. Most of Tsubasa’s internal monologue from the novel was cut, but plenty made it into the show in the form of quick flashes of text that had been used for the same purpose in prior adaptations. 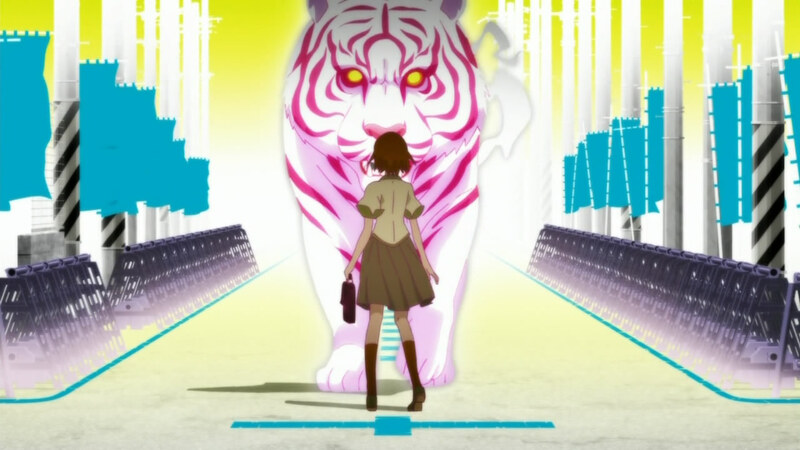 Tsubasa’s encounter with the tiger was appropriately surreal and quite reminiscent of Kaiki’s first appearance in Nisemonogatari. The montage of Tsubasa getting to the abandoned Eiko Cram School, slowly collecting more bags was nice and efficient, skipping over some redundant details of her buying food and underwear. 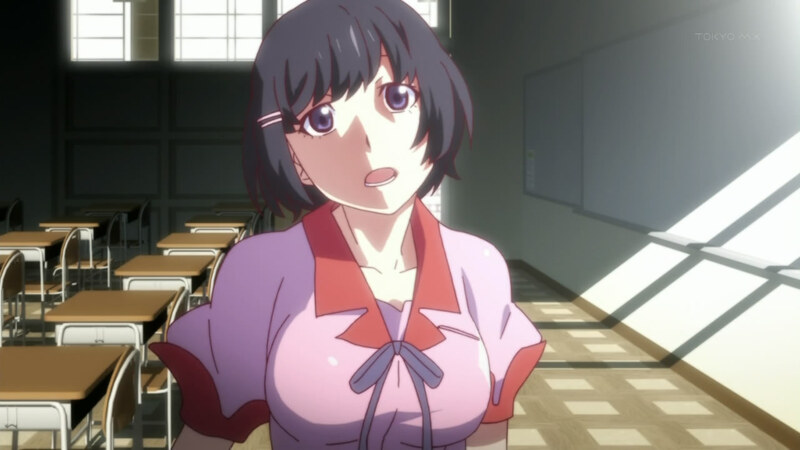 The highlight of the episode was Hitagi’s distraught awakening of Tsubasa at the school, where we got to see her animated in ways that might have seemed unimaginable (it’s noted that she cried for about a half hour in Tsubasa’s arms). Hitagi’s presence also brings out purple frames in addition to the black and red we’re already used to seeing. This opening episode seems to establish that this season won’t be too different from previous ones. But the show doesn’t remain stagnant, embracing the new narrator and building on previously established tools. Shaft’s adaptation is again very close to the source material, leaving me curious as to how they’ll present some of its significant meta games – already from this episode we know that it won’t be ignoring them. And again, there’s a solid story supporting it all. Tsubasa’s character is a fascinating one; I fell in love with her upon reading Kizumonogatari, and Nekomonogatari White only made that love stronger. I won’t spoil what this story does with her character, but needless to say, when she says that she will destroy the pedestal that Araragi had put her on and show herself to be just another human, she isn’t lying. I think we’re in for a fun ride. 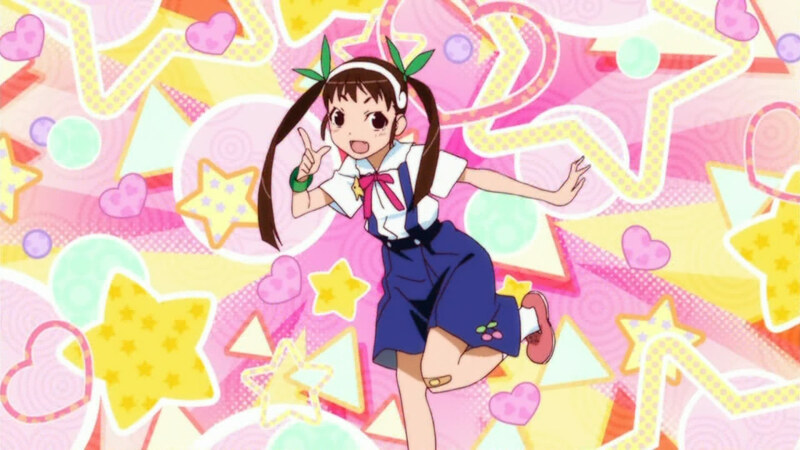 Mayoi without her backpack!? We’ll have to wait a few episodes for the details on that one. So yeah, not a bad opening at all. Already, there’s a lot of intrigue going on and with Nekomonogatari Black having come out a short while ago, I had no problems getting back into this series. Other than the protagonist missing mysteriously, it looks like Nekomonogatari White is jumping back into the usual tales of fanservice and supernatural occurrences. …I don’t know what else I can say other than it was so SHAFT that it hurt, and it really wasn’t all that different from any other Monogatari media we’ve seen animated. Both of these things being pretty good things. I’d like to know the meaning of some of the imagery that was going on in the OP and EDs, but I’m sure I’ll figure it out as this series goes on. …I honestly have no complaints about this episode, since it was an interesting mix of new and old (the only new really being Tsubasa narrating) and I never had a problem with any Monogatari before this. 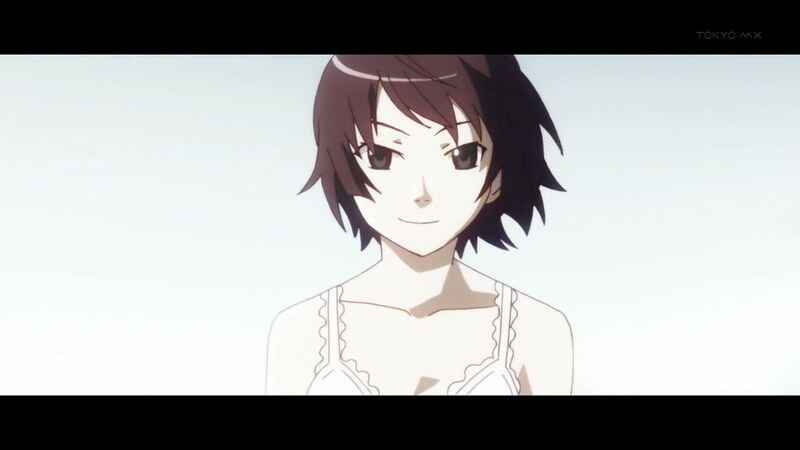 Hope you got your fill of Senjougahara in this one, because it’ll be a while before she comes to the forefront again! Ah, love the edit notes, lvlln. That stuff is good to know. Agreed! When I watched Nisemonogatari a while back your edit notes were the first thing I checked immediately after every episode, and I look forward to more with the new season. One thing I always like is how detailed the notes are. Because I guess despite being adapted accordingly, there are still some stuff being cut out to support the time frame. Lvlln is the God of Notes. That sounds almost like Robotics;Notes. Make this an anime. Parkour Robots FTW! Ah, if only. I’m afraid they’ll likely pick up the next episode after the shower, similar to how Koyomi kissing Karen was skipped over in Nisemonogatari. I hate it when they tempt us with something then completely drop it afterwards. No sense of fair play. It’s not the same as having the actual thing animated right in front of you. Kind of a stale consolation, right? We don’t know how far they’re capable of going. Anything is possible. Well, they would do it in the middle of an episode, not cliffhanger it; if Nisemono episode four is any indication, or Bakemono episode 12 with Hitagi’s full tease. oh god shaft bring me more of these! where is my kizumonogatari movie! I know right? It’s been more than a year and waiting around is agonizing. More Monogatari!! 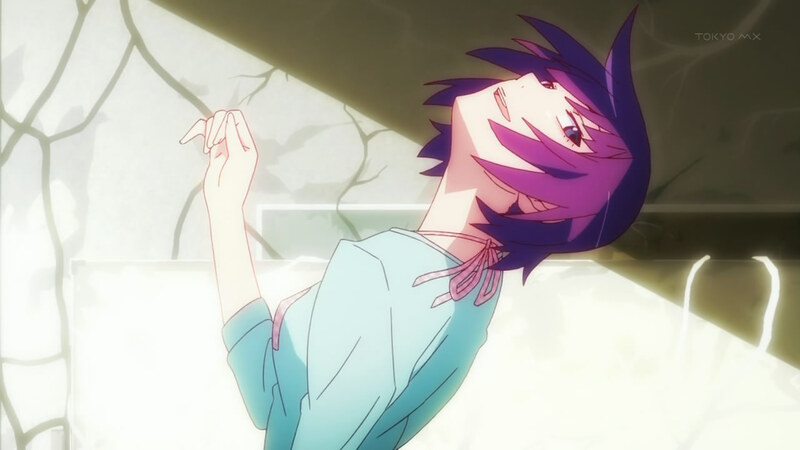 All is right with the world and I got a huge dose of Senjougahara. Her crying in the abandoned school threw me off a bit. Her appearance thanks to her short hair and her interest in seeing another girl’s naked body had me seeing her as Kanbaru for a moment. We got denied a shower scene between her and Tsubasa. Damn it!! From cat to tiger. That’s quite a trade up for Tsubasa. I wonder how a single individual can be afflicted by an oddity a second time. I assume they’d have the ability to perceive other oddites once their curse is lifted, not susceptible to falling into the same state again. When Hitagi was getting her into the shower, Hanekawa found herself wondering just how unrequited Suruga’s crush was back in middle school. I’ll take that as a sign she’s starting to be open minded about “things”. And I think since meeting Koyomi, Suruga is supposedly going both ways. Maybe’s she’s still into Senjougahara but I don’t see her pushing Koyomi away either. Kanbaru is looking to play, “pick it up when it all falls down”. 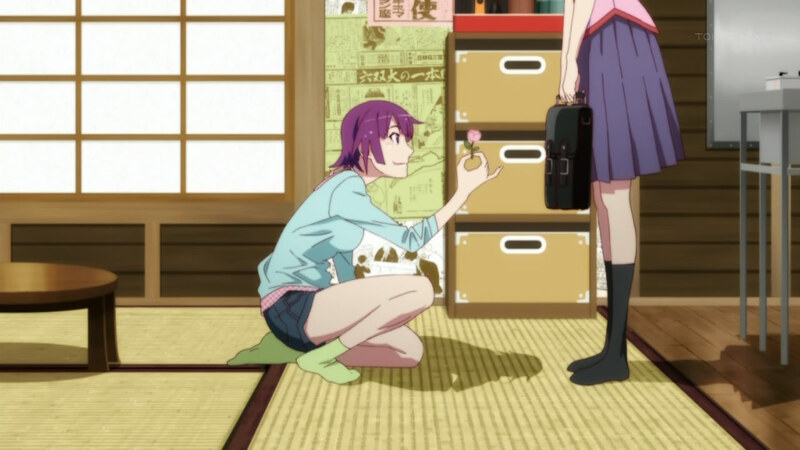 She sees it as Hitagi crahes, Tsubas is the rebound, and Kanbaru is the end game. Of course, Shinobu is supreme all along. Great review for a great show, you’ve hit some sweet spots. I like the show, but I do note that my enjoyment falls off quite the cliff when Tsubasa and Hitagi aren’t in the show. 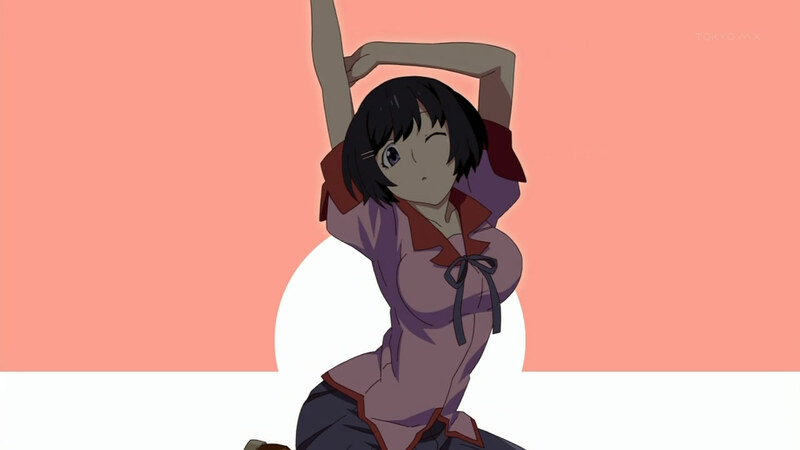 So it’s not great to know that there will be less Hitagi in the show (and more of characters I don’t particularly like). The next arc will have an awesome Tsubasa appearance if they stick to the LN. Not just Senjougahara. Since Nisemonogatari, she, Tsubasa and Karen have all cut their hair. The reason behind it? Who knows. Though the only one who did the opposite and currently has longer hair is Kanbaru. I guess the author felt it was time to inverse a few things. Don’t you guys know? Women looking for a guy grow their hair out. When they get one, they cut it. This always happens. 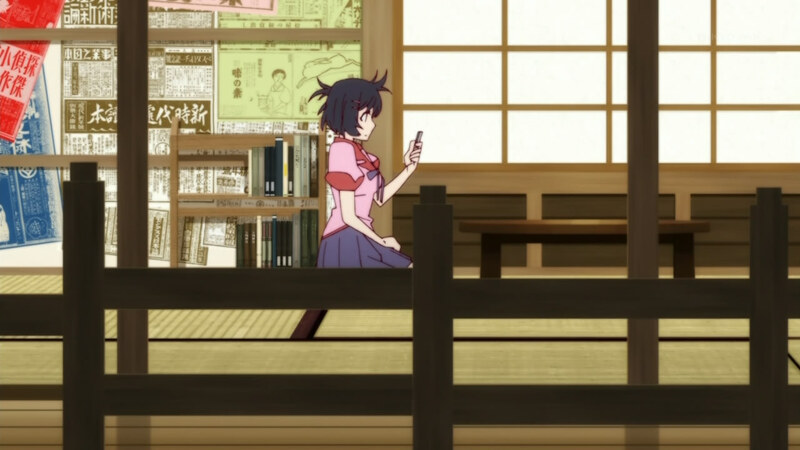 Kanbaru might like Araragi, but she’s not nearly as interested in him that way really. All those other girls have found their guy, and they’re going to stick with that until it’s hopeless. Then they’ll grow it out again. Note, mostly tongue in cheek, but this actually happens WAY more than you think. Does it apply when they find a boy/girl (for Kanbaru) and can’t get to date them? Poor Tsubasa. An answer to that has yet to be found. One would guess it’s a 50/50 chance thing. I can agree with that. It’s a difference between who likes what. Some guys prefer short hair, others long. Personally, Tsubasa looks better the way she is now. The glasses didn’t do her justice which is why I liked her better as Black Hanekawa. If you’re a fan of Koyomi, you’ll have to wait a few episodes till the next arc. He’s featured prominently in only a couple of the arcs; the rest are very focused on the girls themselves. Nisio seems to be a big fan of playing with his characters’ hair. Togame got a pretty significant haircut in Katanagatari. With Tsubasa, the stated reason was “heartbreak,” which lead to the image change including losing her glasses. Without spoiling anything significant, her hair isn’t done changing, as we’ll see in this story. In fact, we’ll see new hairstyles on almost all the heroines in the stories that come. Even a certain character whose appearance is normally static. I do like the variety this provides, and the added realism. After all, normal people don’t remain static and do change their hair from time to time. That’s another standard reason: going for a change of style after a relationship (or almost-relationship) ends. But honestly, I know tons of ladies who had long hair, got in a committed relationship, and cut it all off. But my anecdotal evidence is that ladies who aren’t in that relationship don’t cut off long hair. Yeah… I remember Togame. When she cut her hair I just kept wondering where Shichika would roll himself in D= It was pretty shocking. I can’t say that Hanekawa was weird with long hair and glasses, but I agree that she looks better the way she is now. Don’t you remember Platinum Disco? Tsukihi changes her hairstyle ALL THE TIME. That’s actually one of her gimmicks. But actually, Koyomi’s sisters don’t appear all that much either this season. And I can say that, yes… Unfortunately, I’m a fan of Koyomi… Too bad he won’t appear here, because I think that when he is on conversations with the girls, things usually get funnier or more interesting. Hanekawa and Senjougahara felt more or less… Awkward. Aaah, idk.